It appears that Hermes Franca and Tyson Griffin will meet in a lightweight clash in The Lone Star State at UFC 103. The yet-to-be-announced event will be popping off inside the American Airlines Center in Dalles, Texas on Setember 19th. MMAWeekly.com confirmed with sources close to the situation that both competitors have verbally agreed to the scrap, however bout agreement have yet to be signed. This will be Franca’s first fight since suffering a nasty knee injury while preparing for his UFC Night Night 17 scrap against Joe Lauzon in February. The Brazilian jiu jitsu ace currently holds a 19-7 professional record, however is only 6-4 inside the Octagon. He has posted a 1-1 record since completing a year-long suspension after testing positive for a banned substance following his loss to then-champ Sean Sherk at UFC 73. Griffin was last seen taking another decision victory at UFC Fight Night 18. 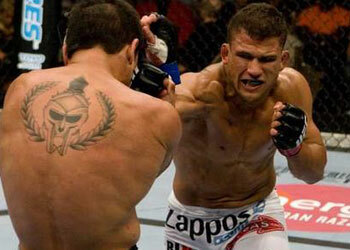 The Xtreme Couture-trained fighter defeated grappling sensation Rafael Dos Anjos. It was Griffin’s seventh consecutive fight that was determined by the judges’ scorecards.